Is it possible to launch GUI of headless VirtualBox' machine? VM "ubuntu 12.04" has been successfully started. Can I somehow launch the normal GUI that I would get by launching the virtual machine from VirtualBox' GUI ? computer because you already have a console session in progress. What can I do in this situation to connect to this virtual machine with GUI ? Is it the only solution for me to turn the machine off and then launch it with the GUI ? It sounds really not convenient to do this every time I need GUI - since I want the machine to be headless. I have also tried xrdp but I cannot connect to the machine - I have it behind the VirtualBox NAT and the ports are forwarded. I just solved this problem by clicking the green arrow "Show" at the top of the VirtualBox GUI while my headless instance was already running. I could see what the VM window would look like inside the "Preview" Pane on the VirtualBox GUI, and after clicking "Show", the VM window came up as though I had initially powered on the machine from the Virtualbox GUI. Edit: When you close the VM window, it will give you the additional option to "Continue running in the background", so your headless instance can revert to being headless again. You can attach to a headless VM by running VBoxSDL --startvm <VMname> --separate. If you run VBoxSDL with no args you can see other options you may be interested in. After getting the same error, I just changed the default port 3389 to something else. I used random port number (in my case 5500). Then it worked. And disabled Windows firewall for a moment - but I don't think firewall was the problem. I solved the problem - I didn't have VirtualBox extension pack installed. While it is added in Linux version of VirtualBox, you have to install it separately on Windows. 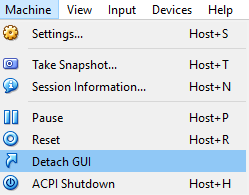 When you are done with using the GUI, you can detach it and your VM will go back headless. I tested this on Windows 10 and it worked as of VirtualBox 5.1.22. Should be the same on Mac/Linux. My experience has been that VirtualBox's RDP is actually provided using VNC, and not the Microsoft RDP protocol. I was able to use the VRDE feature using VNC Viewer (rather than Microsoft Remote Desktop). In case it helps, here are the commands I used to configure VRDE access to a VM which runs on a headless server (not keyboard, mouse, monitor attached). Not the answer you're looking for? Browse other questions tagged virtualbox virtual-machine remote-desktop gui headless or ask your own question. Is it possible to bring to front (foreground) some virtual machine running on background (headless) in VirtualBox? In VirtualBox Headless Mode can I display the UI on demand? Is it possible to create a Windows 7 virtual machine on Ubuntu Server without GUI? How can I work out why my headless VirtualBox VM is not booting? VirtualBox can not run as normal user. 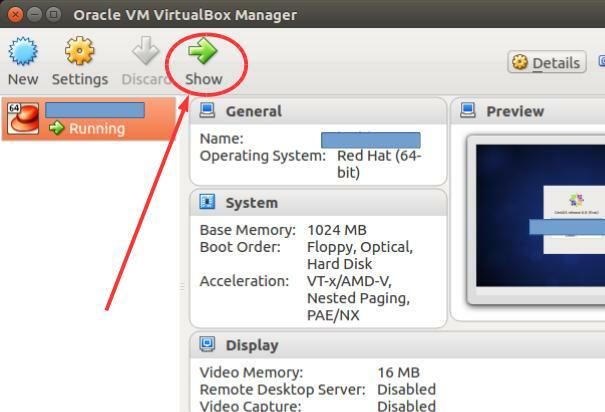 How to close VirtualBox “Detached/Headless” console window? Running Virtualbox Windows 7 VM: GUI vs Headless + RDP Which is more efficient?